Note: Recently, I put The Seventh Seal on my movie confessions post as one of the films I’m embarrassed I haven’t seen. I decided to start watching those films, and began my marathon with The Seventh Seal. The Seventh Seal may be the most unique film I’ve ever seen. After I saw it, I was blown away by its beauty and its message. Director Ingmar Bergman is a master of the screen, and The Seventh Seal is considered one of his strongest works. Indeed, it may rank as one of the best films of all time and is certainly my favorite film that I’ve seen from him. The film is about a knight named Antonius Block (Max von Syndow). Block has just returned after a ten year crusade and once he arrives at the beach with his squire Jöns (Gunnar Björnstrand), Death (Bengt Ekerot) meets up with him. Hoping to stall his demise, he challenges Death to a gam of chess. This chess game is the central theme of the film. Block has come home wanting to know God. During the Crusades he left his wife and home and has accomplished nothing but violence and bloodshed. He wants answers to his questions and believes he can get them from Death. The Seventh Seal is also paced like a game of chess. That is not a complaint but a compliment. The suspense moves as the game progresses. By the end of the game the film takes a surprising turn. The other part of the film revolves around Jof (Nils Poppe), his wife Mia (Bibi Anderson), and their son Mikael. Jof wants Mikael to be an acrobat but Mia wants him to do something else. Together with their boss Jonas Skat (Erik Strandmark), they travel across Sweden to act out plays in local towns and try to avoid the Black Plague that’s currently scourging the nation. But Jof and his family are not unimportant side characters. Jof can see visions of angels and other religous figures. When he meets Block and travels with him through the forest, he is frightened to see Block playing chess with Death, while the others just believe Block is playing with himself. Jof’s family represents innocence, as they are threatened by the plague and Death himself. One notable detail about The Seventh Seal is beautifully shot. The cinematography is rich and detailed, and Bergman’s direction is fantastic. The movie’s sets feel so real as they are meticulously detailed. The Seventh Seal is an avant garde film, a genre I have recently gotten into since attending the Tribeca Film Festival. Bergman has many many avant garde films, and this is surely (at least of what I have seen) his richest work. The religious themes in The Seventh Seal are quote strong, as the characters in the film are all overly devout. In one scene, a woman with the plague is being burn as the priests believe she has the Devil inside of her. Bergman reveals to the audience how extreme the beliefs were in the Medieval age . Overall, The Seventh Seal may be one of my favorite films of all time. It is surely a classic that is a fantastic representation of avant garde film. I’ll be sure to see some more of Bergman’s work after this. 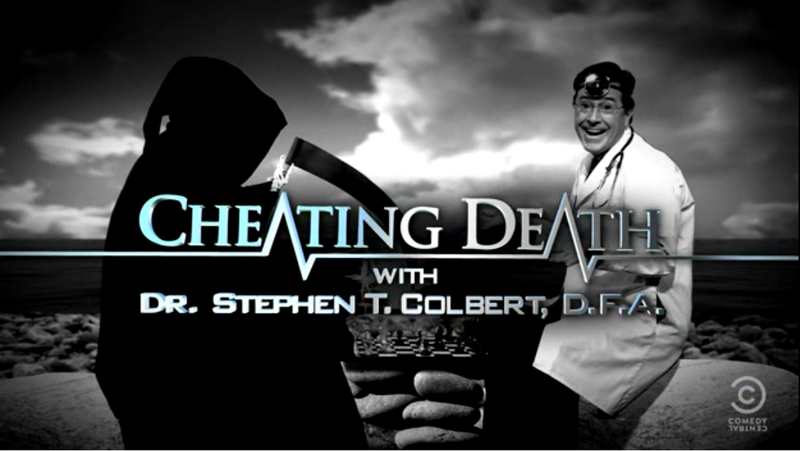 Oh yes, on The Colbert Report, Stephen Colbert has a segment called “Cheating Death.” The opening of the short is a homage to The Seventh Seal. You can see it below. Yeah. I’m going to watch much more Ingmar Bergman films now. The Seventh Seal’s one of the best film’s I’ve ever see. It blew me away the first time I saw it. Then I went a bit crazy buying a bunch more Criterion Collection films. Great post, that image you have used is one of the most memorable images i have seen in film. Thanks! 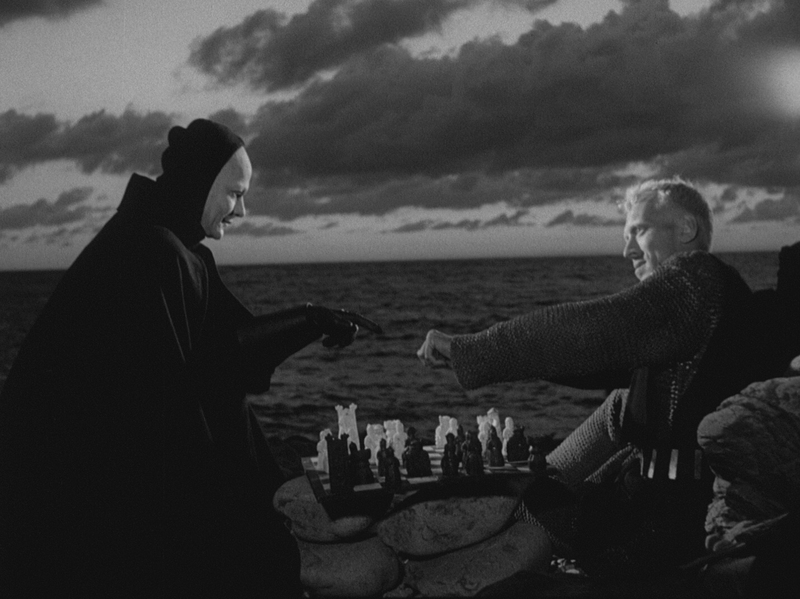 Before I even saw The Seventh Seal, I knew that iconic chess scene.